Elliott Bay Landscape Design Inc. is a design build firm offering a one stop shop for landscape construction and residential garden installation. We provide in house design services on an hourly basis with finished design projects generally ranging from $800.00 to $2000.00 depending on the scope of work to be designed and the size of the project. We also collaborate with other designers by providing construction services to install their design work. Over the years we have forged a very strong relationship with Octavia Chambliss who is an award winning landscape designer from Bainbridge Island. She provides services throughout the greater Seattle area. You can view her work at www.octaviachambliss.com. The vast majority of the incredible gardens displayed on her site were constructed with the services of Elliott Bay Landscape Design Inc. Whether you choose to have us design and install, or work with another designer first, Elliott Bay Landscape Design Inc. can bring the appropriate resources to the equation to synchronize the design build process. We believe that a successful garden starts with a well thought out plan and requires the flexibility to massage the plan as needed during construction. For this reason, hiring a design/build firm, or a designer and a contractor who have a well established track record of successful projects is very important to ensure the best possible results. We pride ourselves on our ability to provide all of the services required for your entire project. With the exception of poured concrete and line voltage electrical work, Elliott Bay Landscape Design Inc. will construct your garden with in-house skills and labor, thus ensuring quality and accountability. The following categories generally describe what we can do to bring your outdoor spaces to their full potential. Stone work is timeless and anchors the garden with authentic materials and custom craftsmanship. We have constructed countless flagstone patios, paths and dry stack walls. We often incorporate decorative boulders as accents. The choices for stone are many and can be viewed at, www.rockmountain.com, www.lakeviewstone.com or www.marenakos.com our primary suppliers. Sometimes budgets, esthetic choices, or other design requirements call for the use of pavers and wall blocks for the best results. Such is the case with driveways and retaining walls that would otherwise require poured concrete. We generally regard poured concrete as the last option, but readily agree that it has its place and may provide the best solution in the right circumstances. When using poured concrete, pavers or wall blocks, we look for the most appropriate options with regards to color and finishes that contribute to the overall design intent. Irrigation and water features are technical systems and our ability to operate at a high level in this area sets us apart from many other landscape service providers. We believe that responsible irrigation is essential for a vibrant garden. We have invested in training and research regarding the most efficient and reliable product combinations to conserve water, automate the process, and allow for adjustability as your garden matures and changes through out the years. We regularly collaborate with www.savingwaterpartnership.org to arrange rebates for our clients who invest in water saving technologies. These rebates can range from $75.00 for a simple rain sensor to over a $1000.00 for combinations of drip zones and smart controller features. For all of our irrigation clients, we offer a bi-annual maintenance service to start and check the system in the spring and winterize the system in the fall. Water features such as ponds, streams, waterfalls and fountains bring the pulse of life to any outdoor space. We highly recommend a careful examination of what feature best fits your anticipated level of participation in the garden. While a simple fountain can be very easy to maintain, a large pond with fish should be considered a bit of a hobby as it will require some ongoing love and attention. At the other end of the spectrum is the dry stream bed which hints at the presence of water with out any of the maintenance. This is also a great option where access into deeper beds can be achieved with a very attractive “river” winding through. The inclusion of a water related element or feature into your garden will provide a level of sophistication and elegance that takes your garden to a higher level. Outdoor carpentry is a fantastic way to incorporate architectural elements into the less structured domain of plants. The use of fences and screens can cover unwanted views and accentuate those which are desired. Skillfully designed and constructed fences can add a sense of custom craftsmanship and provide privacy and security. To compliment a patio or fence, the use of arbors and trellises can provide the “ceiling” to your outdoor room by creating a sense of overhead enclosure. This is also a great way to invite plant material with a small ground level footprint to establish a middle layer in the landscape canopy. We have a grape covered entrance arbor at our own home that welcomes guests with the suggestion of natural bounty. Decks are one of the best ways to make the transition from indoor spaces to outdoor rooms. For us, this is essential in making a successful garden for our clients. The more fluid the transition from indoors to the garden, the more it will be a daily part of your life. We have considerable experience with composite decking materials, as well as, cedar and hardwood option like Irion wood and Tiger wood. Raised beds are often constructed with cedar and provide an excellent option for a very manageable vegetable garden space. 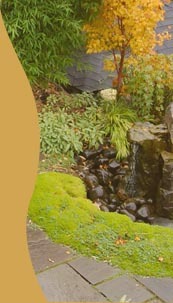 Elliott Bay Landscape Design can create and install a wide range of plant vignettes that will work well in our climate. Our focus tends to be on foliage color and texture, combined with plant form to create a balanced composition though out the year. Perennials are beautiful and have their place in most gardens, but their overuse can lead to bare beds during winter and much higher maintenance needs during the rest of the year. Our goal is to create seasonal interest all year and provide the right balance of show vs. maintenance for each client that we serve. When designing for planted spaces we pay keen attention to the surrounding landscapes and consider how your garden will integrate with the architecture of your home, your personal style, and your neighbors adjoining spaces. We work to preserve views and screen less desirable perspectives. The use of repetition is important to unify and tie together spaces while maintaining enough variation to keep it interesting. Plants are the most dynamic part of the garden. They change through the cycles of the seasons and over the course of their lives. Light is the least tangible and often most essential element. In our region light can be a scarce commodity. Plants need it and so do we. Incorporating low voltage lighting into the garden creates soft accents and an ambiance of elegance. If employed strategically, it can extend our visual connection to the garden during the short winter days. This is always the time of year when we most need to stay in touch with the natural world around us. Through the use of path lights, up-lights and subtle spot lights, we can create softly lit night-scapes for safe circulation and aesthetically pleasing effects. When viewed from the inside of you home, this can dramatically increase the sense of space by extending your night time views out into the garden. ©2019 Elliott Bay Landscape Design Inc.